The Hong Kong Special Administrative Region (香港特別行政區, 香港特别行政区, commonly known as Hong Kong (Chinese: 香港), is one of the two special administrative regions of the People's Republic of China, along with Macau. Comprising more than 260 islands, the territory is located on the eastern side of the Pearl River Delta, bordering Guangdong province in the north and facing the South China Sea in the east, west and south. Hong Kong was a crown colony of the United Kingdom from 1842 until the transfer of sovereignty to the People's Republic of China in 1997. Hong Kong was declared a free port to serve as an entrepôt of the British Empire, and grew rapidly into a center for international trade. Between December 25, 1941, and the end of World War II, Hong Kong was under Japanese control. Rapid industrialization between 1960s and 1990s made Hong Kong one of the four Asian Tigers of economic growth. Driven by exports, the economy grew at an average annual rate of 8.9 percent in the 1970s. Many of the manufacturing operations moved to mainland China during the 1980s and Hong Kong became a global financial center, with industry now constituting just 9 percent of the economy. Hong Kong is one of the most densely populated countries/dependencies in the world, with an overall density of more than 6,200 people per km². The Sino-British Joint Declaration and the Basic Law of Hong Kong stipulate that Hong Kong operate with a high degree of autonomy until at least 2047. The People’s Republic of China is responsible for the territory's defense and foreign affairs, while Hong Kong maintains its own legal system, police force, monetary system, customs policy, immigration policy, and delegates to international organizations and events. Human settlement in the location now known as Hong Kong dates back to the Paleolithic era. The region was first incorporated into Imperial China during the Qin Dynasty, and served as a trading post and naval base during the Tang Dynasty and the Song Dynasty. The area's earliest recorded European visitor was Jorge Álvares, a Portuguese mariner who arrived in 1513. Contact with the United Kingdom was established after the British East India Company founded a trading post in the nearby city of Canton. In 1839, the refusal by Qing Dynasty authorities to import opium resulted in the First Opium War between China and Britain. Hong Kong Island was first occupied by British forces in 1841, and then formally ceded from China under the Treaty of Nanking at the end of the war. The British established a Crown Colony with the founding of Victoria City the following year. In 1860, after China's defeat in the Second Opium War, the Kowloon Peninsula south of Boundary Street and Stonecutter's Island were ceded to Britain in perpetuity under the Convention of Peking. In 1898, Britain obtained a 99-year lease of the adjacent northern lands and Lantau Island, which became known as the New Territories. As part of its military campaign in World War II, the Empire of Japan invaded Hong Kong on December 8, 1941. The Battle of Hong Kong ended with British and Canadian forces surrendering control of the colony to Japan on December 25, 1941. During the Japanese occupation of Hong Kong, civilians suffered from widespread food shortages caused by the imposition of rations, and hyper-inflation due to forced exchange of currency for military notes. Hong Kong's population declined from 1.6 million before the invasion to about 600,000 in 1945, when the United Kingdom resumed control of the colony following Japan's defeat in the war. Hong Kong's population recovered quickly after the war, as a wave of mainland migrants arrived as refugees from the ongoing Chinese Civil War. With the proclamation of the People's Republic of China in 1949, more migrants fled to Hong Kong for fear of persecution by the Communist Party of China. Many corporations in Shanghai and Guangzhou also shifted their operations to Hong Kong. The colony became the sole point of contact between mainland China and the Western world, as the communist government increasingly isolated the China from outside influence. Trade with the mainland was interrupted during the Korean War, when the United Nations ordered a trade embargo against the communist government. The low cost and easy availability of labor contributed to the growth of the textile and manufacturing industries. As Hong Kong rapidly industrialized, its economy became driven by exports to international markets. Living standards rose steadily along with industrial growth. The construction of Shek Kip Mei Estate in 1953 marked the beginning of a public housing program. Hong Kong was disrupted by chaos during the riots of 1967, when pro-communist leftists, inspired by the Cultural Revolution on the mainland, turned a labor dispute into a violent uprising against the colonial government which lasted until the end of the year. Established in 1974, the Independent Commission Against Corruption dramatically reduced corruption in the government. When the People's Republic of China initiated a set of economic reforms in 1978, Hong Kong became the main source of foreign investment for the mainland. A Special Economic Zone was established the following year in the Chinese city of Shenzhen, located immediately north of the mainland's border with Hong Kong. Services gradually replaced textiles and manufacturing in the economy of Hong Kong, as the financial and banking sectors became increasingly dominant. After the Vietnam War ended in 1975, the Hong Kong government became involved in the processing of refugees from Viet Nam. In the 1980s, with the lease of the New Territories due to expire within two decades, the governments of the United Kingdom and the People's Republic of China discussed the issue of Hong Kong's sovereignty, and in 1984, the two countries signed the Sino-British Joint Declaration, agreeing to transfer the sovereignty of Hong Kong to the People's Republic of China in 1997. The declaration stipulated that Hong Kong would be governed as a special administrative region, retaining its laws and a high degree of autonomy for at least 50 years after the transfer. Lacking confidence in this arrangement, some residents chose to emigrate from Hong Kong, particularly after the Tiananmen Square protests of 1989. The Basic Law of Hong Kong, which would serve as the constitutional document after the transfer, was ratified in 1990. Over strong objections from Beijing, Governor Chris Patten introduced democratic reforms to the election process for the Legislative Council of Hong Kong. The transfer of the sovereignty of Hong Kong occurred at midnight on the night of June 30, 1997, marked by a handover ceremony at the Hong Kong Convention and Exhibition Centre. Tung Chee Hwa assumed office as the first Chief Executive of Hong Kong. The Asian financial crisis of 1997 that hit many East Asian markets affected Hong Kong's economy. The H5N1 avian influenza also surfaced in Hong Kong that year. Implementation of the Airport Core Programme led to the opening of the new Hong Kong International Airport in 1998, after six years of construction. The project was part of the ambitious Port and Airport Development Strategy that was drafted in the early 1980s. The outbreak of severe acute respiratory syndrome took hold of Hong Kong in the first half of 2003. That year, half a million people participated in a march to voice disapproval of the Tung administration and a proposal to implement Article 23 of the Basic Law, which had raised concerns over infringements on rights and freedoms. The proposal was later abandoned by the administration. In 2005, Tung submitted his resignation as chief executive. Donald Tsang, the Chief Secretary for Administration, was selected as chief executive to complete the term. Areas of urban development and vegetation are visible in this false-color satellite image. Hong Kong consists primarily of Hong Kong Island, Lantau Island, Kowloon Peninsula and the New Territories as well as some 260 other islands in the South China Sea. The Kowloon Peninsula is attached to the New Territories to the north, and the New Territories spans northwards, eventually connecting with mainland China across the Sham Chun River (Shenzhen River). Lantau is the largest island. Hong Kong Island is the second largest island and the most populated. Ap Lei Chau is the most densely populated island in the world. The name "Hong Kong," which literally translates to "fragrant harbor," is derived from the area around present-day Aberdeen on Hong Kong Island, where fragrant wood products and fragrant incense were once traded. The narrow body of water which separates Hong Kong Island from the Kowloon Peninsula is known as Victoria Harbor and is one of the deepest natural maritime ports in the world. Despite Hong Kong's reputation of being intensely urbanized, the territory has made much effort to promote a green environment. Much of the territory remains undeveloped because the terrain is mostly hilly to mountainous with steep slopes. Of the territory's 1,104 square kilometres (426 square miles), less than 25 percent is developed. The remaining land is remarkably green with about 40 percent of the landmass reserved as country parks and nature reserves. Most of the territory's urban development exists on the Kowloon peninsula, along the northern shores of Hong Kong Island and in scattered settlements throughout the New Territories. Hong Kong's long, irregular and curvaceous coastline provides many bays, rivers and beaches. Despite the territory's extensive wooded and ocean setting, Hong Kong's air ranks as among the most polluted, and environmental awareness is growing. Approximately 80 percent of the city's smog originates from other parts of the Pearl River Delta. Hong Kong is 60 kilometres (37 miles) east of Macau on the opposite side of the Pearl River Delta. It borders the city of Shenzhen in Guangdong Province to the north. The highest elevation in the territory is at Tai Mo Shan, at a height of 958 metres (3,142 ft) above sea level. Lowlands exist in the northwestern part of the New Territories. The Hong Kong Observatory is the government department responsible for providing meteorological forecasts, weather-related hazard warnings and geophysical surveys for the territory. ]]Hong Kong's climate is subtropical and prone to monsoons. It is cooler and dry in the wintertime which lasts from around December to early March, and is hot, humid and rainy from spring through summer. It is warm, sunny, and dry in autumn. Hong Kong occasionally has tropical cyclones in the summer and early autumn. The ecology of Hong Kong is mostly affected by the results of climatic changes. Hong Kong's climate is seasonal due to the alternating wind directions between winter and summer. Hong Kong has been geologically stable for millions of years, though landslides are common especially after heavy rainstorms. Flora and fauna in Hong Kong are affected by climatic change, sea level alternation and human impact. The highest recorded temperature in Hong Kong is 38°C (100.0°F) while the lowest recorded temperature is -4°C (25.0°F). Meanwhile, the highest and lowest temperatures ever recorded by the Observatory are respectively 36.1°C (97.0°F) on August 19, 1900 and August 18, 1990, and 0.0°C (32.0°F) on January 18, 1893. The average temperature in the coldest month, January, is 16.1°C (61.0°F) while the average temperature in the hottest month, July, is 28.7°C (83.7°F). The territory is situated south of the Tropic of Cancer which is approximate to Hawaii in latitude. In winter, strong and cold winds generated from the north cool the city; in the summer, the wind's prevailing direction changes and brings the warm and humid air in from the southwest. This climate can support a tropical rainforest. Pursuant to the Hong Kong Basic Law, Hong Kong's constitutional document, the local Hong Kong government retains sovereignty over the territory except in areas of national defense and foreign relations. Only the Chief Executive, the head of territory and head of government, is selected by the Chief Executive Election Committee composed of 800 members. All other functionaries of the government, including members the executive and legislative branch, are either appointed by the Chief Executive (directly or by proxy) or elected by voters. In theory, this arrangement guarantees that Hong Kong is governed almost independently of the PRC and can retain its unique cultural, legal and economic infrastructure. In practice, however, some have accused Beijing of excess intrusion into Hong Kong domestic affairs beyond levels permitted under Basic Law. Laws in Hong Kong are enacted only by approval of the Chief Executive and majority consent from the 60 seat Legislative Council of Hong Kong, or LegCo. 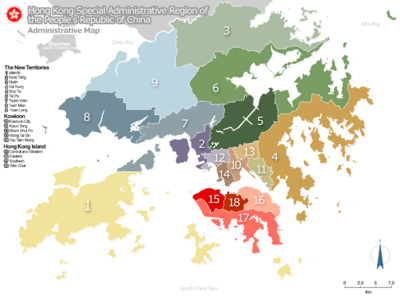 Although the nature of Hong Kong's government is often said to be undemocratic, half of LegCo's seats are elected under universal suffrage, with the other half selected by functional constituencies consisting of trade unions and special interests. Basic Law guarantees that all seats will eventually be elected under universal suffrage. Donald Tsang has held the office of the Chief Executive since his election on June 16, 2005 by an electoral committee appointed by Beijing. He was re-elected as [[Hong Kong Chief Executive election, 2007 | Chief Executive on March 25, 2007 for another five year term, which began on July 1, 2007. The Peoples Republic of China set up a Provisional Legislative Council (PLC) in 1996 just before the handover, which moved to Hong Kong to have its meetings after the handover. It repealed some laws passed by the colonial Legislative Council, and passed some new laws, such as the Public Order Ordinance, which requires permission from police to hold a demonstration if the number of participants exceeds thirty. Legislative Council elections were held in May, 1998, September]] 2000 and again in September of 2004, with the next election scheduled for 2008. According to the Hong Kong Basic Law, the present third term of the Legislative Council has 25 seats directly elected from geographical constituencies and 30 seats elected from functional constituencies. The 1998, 2000 and 2004 Legislative Council elections were seen as free, open, and widely contested, despite the protests of 'pro-democratic' politicians who contended that the electoral basis for these seats is too narrow. On September 24, 2005, 25 Hong Kong pro-democracy LegCo members, some of whom had been previously labeled as traitors by Beijing after the 1989 Tiananmen Square crackdown and barred from entering the mainland, crossed the border into the southern province of Guangdong, following an unprecedented invitation by the Peoples Republic of China which was seen as a gesture of goodwill. While Hong Kong is not an independent country, it retains its own delegation in international organizations such as the Asia-Pacific Economic Cooperation and the Olympic Games, although it changed its official name in these functions from "Hong Kong" to "Hong Kong, China" after 1997. Hong Kong also participates in international events by including a delegate with the PRC's representative group. In contrast to mainland China's civil law system, Hong Kong continues to follow the common law tradition established by British colonial rule. Article 84 of the Basic Law of Hong Kong allows Hong Kong's courts to refer to decisions (precedents) rendered by courts of other common law jurisdictions. Articles 82 and 92 allow judges from other common law jurisdictions to participate in proceedings of Hong Kong's Court of Final Appeal and sit as Hong Kong judges. As in England, lawyers in Hong Kong can choose to practice as either barristers or solicitors. The vast majority of lawyers are solicitors, who are licensed and regulated by the Law Society of Hong Kong. Barristers, on the other hand, are licensed and regulated by the Hong Kong Bar Association. Only barristers are allowed to appear in the Court of Final Appeal and the High Court. Just as the common law system is maintained, so are British courtroom customs such as the wearing of robes and wigs by both judges and lawyers. According to the Article 63 of the Basic Law of Hong Kong, the Department of Justice controls criminal prosecutions, free from any interference. 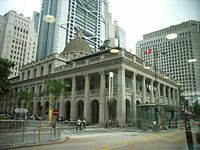 It is the largest legal institution in Hong Kong, and its responsibilities involve legislation, judicial administration, prosecution, civil representation, legal and policy drafting and reform, and the legal profession. Aside from prosecuting criminal cases in Hong Kong, officials of the Department of Justice also appear in court on behalf of the government in all civil and administrative lawsuits against the government. As the protector of public interests, it may apply for judicial reviews and assign legal representation on behalf of public interest to take part in the trial of cases that involve material public interests. Each district is represented by a District Council that advises the Government of Hong Kong on local matters such as public facilities, community programmes, cultural activities and environmental improvements. The Home Affairs Department is the governmental body responsible for coordinating services and communicating government policies and plans to the public. It interacts with the public at the local level through corresponding district offices. There are no formal definitions for cities and towns in Hong Kong. The historic boundaries of Victoria City, Kowloon and New Kowloon are stated in law, but these entities no longer possess any legal or administrative status. Hong Kong maintains a capitalistic economy built on a policy of free market, low taxation and government non-intervention. It is an important centre for international finance and trade, with the greatest concentration of corporate headquarters in the Asia-Pacific region. In terms of gross domestic product per capita and gross metropolitan product, Hong Kong is the wealthiest urban centre in the People's Republic of China. The GDP per capita (PPP) of Hong Kong even exceeded the four big economies in Western Europe (UK, France, Germany, Italy) and Japan in Asia. Continuing the practice established under the British administration, the Government of Hong Kong generally leaves the direction of the economy to market forces and the private sector. Since 1980, the government has usually played a passive role under the official policy of positive non-interventionism. Hong Kong has often been cited as a prime example of laissez-faire capitalism in practice, most notably by economist Milton Friedman. It has ranked as the world's freest economy in the Index of Economic Freedom for thirteen consecutive years, since the inception of the index in 1995. It also places first in the Economic Freedom of the World Report. Hong Kong has little arable land and few natural resources within its borders, and must therefore import most of its food and raw materials. Hong Kong is the world's eleventh largest trading entity, with the total value of imports and exports exceeding its gross domestic product. As of 2006, there are 114 countries that maintain consulates in Hong Kong, more than any other city in the world. A large portion of Hong Kong's exports are re-exports, which are products made outside of the territory, especially in mainland China, and distributed through Hong Kong. Even before the transfer of sovereignty to the People's Republic of China, Hong Kong had established extensive trade and investment ties with mainland China. The territory's autonomous status enables it to serve as a point of entry for investments and resources flowing into the mainland. It is also a connecting point for flights from the Republic of China on Taiwan destined for the mainland. The currency used in Hong Kong is the Hong Kong dollar. Since 1983, it has been pegged at a fixed exchange rate to the United States dollar. The currency is allowed to trade within a range between 7.75 and 7.85 Hong Kong dollars to one United States dollar. The Hong Kong Stock Exchange is the seventh largest in the world, with a market capitalization of about US$1.69 trillion as of February 2007. In 2006, the total value of initial public offerings conducted in Hong Kong was second highest in the world after London. The City of London Corporation's Global Financial Centers Index (GFCI) 2007, which evaluates the competitiveness of 46 financial centers worldwide, ranks Hong Kong as the third-best financial centre globally and the strongest centre in Asia. Hong Kong's economy is dominated by services, which account for over 90 percent of its gross domestic product. In the past, manufacturing had been the most important sector of the economy, as Hong Kong industrialized following the Second World War. Driven by exports, the economy grew at an average annual rate of 8.9 percent in the 1970s. Hong Kong underwent a rapid transition to a service-based economy in the 1980s, when growth averaged 7.2 percent annually. Many of the manufacturing operations moved to mainland China during this period, and industry now constitutes just 9 percent of the economy. As Hong Kong matured to become a financial center, growth slowed to an average of 2.7 percent annually in the 1990s. Together with Singapore, South Korea, and Taiwan, Hong Kong is known as one of the Four Asian Tigers for its high growth rates and rapid industrialization between the 1960s and the 1990s. The economy suffered a 5.3 percent decline during 1998, in the aftermath of the Asian financial crisis. A period of recovery followed, with the growth rate reaching 10 percent in 2000, although deflation persisted. In 2003, the economy was greatly affected by the outbreak of Severe Acute Respiratory Syndrome (SARS), which reduced economic growth to 2.3 percent that year. A revival of external and domestic demand led to a strong recovery the following year, as cost declines strengthened Hong Kong export competitiveness. The 68-month-long deflationary period ended in mid-2004, with consumer price inflation hovering at near zero levels. Beginning in 2003, the Individual Visit Scheme has allowed travelers from some cities in mainland China to visit Hong Kong without an accompanying tour group. As a result, the tourism industry of Hong Kong has benefited from an increase in mainland visitors, further aided by the opening of Hong Kong Disneyland Resort in 2005. The economy continues to grow strongly with the return of consumer confidence and rising trade. 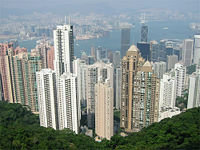 Hong Kong has set low rates in both personal and corporate taxation. In 2006, Hong Kong's per-capita GDP ranked as the 6th highest in the world at US$38,127, ahead of countries such as Switzerland, Denmark, and Japan. Its GDP ranked as the 40th highest at US$253.1 billion. Hong Kong's population increased sharply throughout the 1990s, reaching 6.99 million in 2006. About 95 percent of Hong Kong's population is of Chinese descent, the majority being Cantonese or from ethnic groups such as Hakka and Teochew. Cantonese, a Chinese language commonly spoken in southern China, is Hong Kong's official dialect. English is also an official language widely spoken by more than 38 percent of the population. According to statistics, some 3.1% regard English as their "usual" language with 34.9 percent speaking it as "another" language. Signs displaying both Chinese and English are extremely common throughout the territory. Since the 1997 handover, new groups of mainland China immigrants have arrived, and the usage of Mandarin, the official dialect of mainland China, has increased as the integration with mainland economy led to a demand in Mandarin speakers. The remaining 5 percent of the population is composed of non-ethnic Chinese forming a highly visible group despite their smaller numbers. There is a South Asian population comprised of Indians, Pakistanis and Nepalese. Vietnamese refugees have become permanent residents. Approximately 140,000 Filipinos work in Hong Kong as foreign domestic helpers. An increasing number of domestic workers also originate from Indonesia. There are also a number of Europeans, Americans, Australians, Canadians, Japanese, and Koreans working in Hong Kong's commercial and financial sector. Considered as a dependency, Hong Kong is one of the most densely populated countries /dependencies in the world, with an overall density of more than 6,200 people per km². Hong Kong has a fertility rate of 0.95 children per woman, one of the lowest in the world and far below the 2.1 children per woman required to sustain the current population. However, population in Hong Kong continues to grow due to the influx of immigrants from mainland China, approximating 45,000 per year. Life expectancy in Hong Kong is 81.6 years as of 2006, fifth highest in the world. Hong Kong's population has an extremely dense urban core, consisting of Kowloon and the north of Hong Kong Island. The rest is relatively sparsely populated, with millions of residents scattered irregularly throughout the New Territories, south Hong Kong island and Lantau Island. An increasing number of citizens are living in Shenzhen, and commuting from mainland China. Since Hong Kong is a former British Crown colony, its education system has roughly followed the British system of education. At the higher education levels, both British and American systems exist. The University of Hong Kong (HKU), the oldest institution of tertiary education in the territory, has traditionally been based on the British model but has incorporated some elements of the American model in recent years. Second to HKU historically, the Chinese University of Hong Kong (CUHK) follows the American model with a characteristically British college system. The Hong Kong University of Science and Technology (HKUST) was established on the American model of higher education. 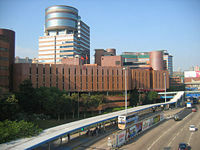 There are nine public universities in Hong Kong, and a number of private institutions of higher education, such as Lingnan University in Tuen Mun, the only university in Hong Kong that provides a liberal arts education. Hong Kong's public schools are operated by the Education and Manpower Bureau of the Government of the Hong Kong Special Administrative Region. The system features a non-compulsory three-year kindergarten, followed by a compulsory six-year primary education and three-year junior secondary education; a non-compulsory two-year senior secondary education leading to the Hong Kong Certificate of Education Examinations and a two-year matriculation course leading to the Hong Kong Advanced Level Examinations. A new “3+3+4”curriculum, consisting of a three-year junior secondary, three-year senior secondary and four-year undergraduate academic system, will be implemented from 2009 (for senior secondary) and 2012 (for tertiary) onwards. There are also tertiary institutions offering various Bachelor's, Master's, and Doctoral degrees, other higher diplomas, and associate degree courses. Most comprehensive schools in Hong Kong fall under three categories: public schools, subsidized schools and private schools. Public schools are rare, and subsidized schools are the most common, run by charitable organizations, often with religious affiliations, and partially financed by government aid and grants. The majority of such religious affiliations are Christian and Catholic, but there are also Buddhist, Daoist, Islamic and Confucian schools. Private schools, often run by Christian organizations, base their admissions based on academic merit rather than on financial resources. Outside this system are the schools under the Direct Subsidy Scheme (DSS) and private international schools. 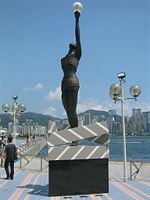 A statue on the Avenue of Stars, a tribute to H.K cinema. Hong Kong is frequently described as a place where East meets West, a meeting reflected in its economic infrastructure, architecture, education, and street culture. On one street corner, there may be traditional Chinese shops selling Chinese herbal medicine, Buddhist paraphernalia or bowls of synthetic shark fin soup. But around the next, one may find theaters showing the latest Hollywood blockbusters, an English-style pub, a Catholic Church or Ronald McDonald inviting passers-by to a Big Mac. 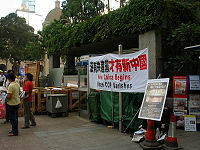 The territory's official languages are Chinese and English; signs in both languages are omnipresent throughout Hong Kong. The government, police and most workplaces and stores conduct business bilingually. British rule may have ended a decade ago, but Western culture is deeply ingrained in Hong Kong and coexists seamlessly with traditional philosophy and practices of the Orient. Hong Kong has an active nightlife in major entertainment districts such as Lan Kwai Fong, Tsim Sha Tsui, Wan Chai. These areas are frequented by visitors, expatriates and locals alike. On a clear day, Victoria Peak offers a spectacular view of the city. There is also a promenade along the Tsim Sha Tsui waterfront, which is popular among young Chinese couples. Shopping is often done at night, as evidenced by the Temple Street Night Market, where one can also catch free performances of Beijing opera (Peking opera). The city's cosmopolitan flavor can also be seen in the wide variety of cuisines available. While different varieties of Chinese selections, especially seafood, are most popular, there are also many European, American, Japanese, Korean, and other restaurants. Ethnic dishes served in cha chaan teng (Chinese tea restaurants) and dai pai dong (open air stalls) are also popular. The people of Hong Kong take their food seriously and many top chefs make their way to the city to show off their talents to these discerning diners. 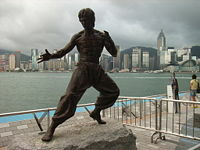 While Hong Kong is a global centre of trade, perhaps the city's most famous export is its entertainment industry, particularly in the martial arts genre. Several Hollywood performers originate from Hong Kong cinema—Bruce Lee, Chow Yun-Fat, Jackie Chan, Michelle Yeoh, and Jet Li, to name a few. Behind the camera, Hong Kong filmmakers have also found recognition in Hollywood, such as John Woo, Wong Kar-wai, Tsui Hark and martial arts choreographers who have designed fight scenes in the Matrix trilogy, Kill Bill and Crouching Tiger, Hidden Dragon. Back in Hong Kong, several homegrown films have also gained international recognition, such as Chungking Express, Infernal Affairs, Shaolin Soccer, Rumble in the Bronx and In the Mood for Love. Acclaimed filmmaker Quentin Tarantino has commented he was strongly influenced by Hong Kong action cinema. Hong Kong is also the world's main hub for Cantopop music. Karaoke culture is also part of Hong Kong's nightlife. The Hong Kong government also supports cultural institutions such as the Hong Kong Heritage Museum, Hong Kong Museum of Art, the Hong Kong Academy for Performing Arts and the Hong Kong Philharmonic Orchestra. Furthermore, the government's Leisure and Cultural Services Department also subsidizes and sponsors the visits of international performers to Hong Kong. The Tian Tan Buddha on Lantau, Hong Kong, the tallest outdoor buddha statue in the world. Hong Kong enjoys a high degree of religious freedom, a right enshrined and protected in its constitutional document, the Basic Law. The majority of Hong Kong's population, as in Mainland China, practice a folk version of Buddhism. This majority includes approximately six million people, close to 90 percent of a total population of less than seven million. A sizable Christian community of around 500,000 exists, forming about 7 percent of the total population; it is roughly equally divided between Catholics and Protestants. 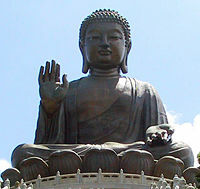 There are also around 200,000 followers each of authentic Buddhism and Taoism. Apart from the major religions, there are also a significant number of followers of other religions, including an estimated 23,000 Mormons, 3000 Jews and a number of Muslims, Hindus, Sikhs and Bahá'ís. Apart from offering religious instructions, many major religious bodies operate schools and provide social welfare facilities. Hong Kong's religious beliefs are tied to the region's early role as a fishing community. The goddess Tin Hau, the protector of seafarers, has been honored with several temples throughout Hong Kong for at least 300 years. Hung Shing, another protector of seafarers, has also been honored for centuries. Hong Kong residents, especially the elder generations, visit Daoist or Buddhist temples to appease the deities and, usually, to request compassion, good health or good fortune. Gifts of food, and in particular fruit, are presented, and incense and paper offerings are burnt in respect. With the transfer of Hong Kong to the Peoples Republic of China, there were significant concerns that restrictions would be placed on religious freedom in Hong Kong. So far, this has proved mostly unfounded. Despite the banning of the Falun Gong movement by Beijing in 1999, adherents are still free to practice in Hong Kong. Similarly, the Catholic Church freely appoints its own bishops in Hong Kong, unlike in mainland China where the only approved 'Catholic' institution is the Chinese Patriotic Catholic Association with bishops and priests appointed by Beijing (though an unofficial and illegal Catholic church maintains contact with the Vatican). A significant issue in the normalization of ties between the PRC and the Vatican is Beijing's insistence that the Vatican drops its diplomatic ties with Taiwan. Hong Kong is the only place in China where missionaries from the Mormon Church can serve. Due to the creative destruction endemic to Hong Kong over the past 50 years, few historical buildings remain in Hong Kong. Instead the city has become a center for modern architecture, especially in and around the Central and Western District (Central). Dense commercial skyscrapers lining the coast of Victoria Harbour between Central and Causeway Bay form one of Hong Kong's most famous tourist attractions, which is ranked as the best skyline in the world. Four of the 15 tallest skyscrapers in the world are in Hong Kong. In Kowloon, which once included the anarchistic settlement called the Kowloon Walled City, strict height restrictions on structures were in force until 1998 when the nearby Kai Tak Airport was closed. With restrictions lifted, several new skyscrapers are under construction in Kowloon, including International Commerce Centre which, when completed in 2010, will become the world's fourth tallest. 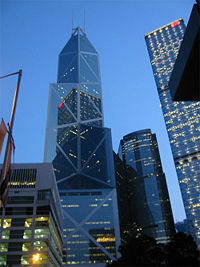 One of the notable buildings in Hong Kong is I. M. Pei's Bank of China Tower, completed in 1990 and now Hong Kong's third tallest skyscraper. The building attracted heated controversy, as its sharp angles were said to cast negative feng shui energy into the heart of Hong Kong. 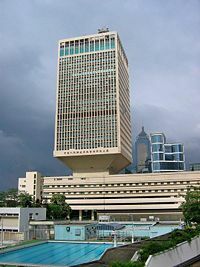 Predating the Bank of China Tower, another well-known structure is the HSBC Headquarters Building, finished in 1985. It was built on the site of Hong Kong's first skyscraper, which was finished in 1935 and was the subject of a bitter heritage conservation struggle in the late 1970s. Both banks' buildings are featured on many of Hong Kong's banknotes. 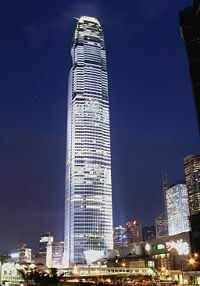 The tallest building in Hong Kong is the International Finance Centre 2. One of the largest construction projects in Hong Kong was the new Hong Kong International Airport on Chek Lap Kok near Lantau, a huge land reclamation project linked to the center of Hong Kong by the Lantau Link, which features three new major bridges: Tsing Ma, the world's sixth largest suspension bridge; Kap Shui Mun, the world's longest cable-stayed bridge carrying both road and railway traffic; and Ting Kau, the world's first major four-span cable-stayed bridge. Particularly noticeable in Hong Kong's skyline and streetscapes is the omnipresence of public housing estates, which began as a squatter resettlement program in the 1950s, and now house close to 50 percent of the population. These estates have evolved from seven-story walk-up apartments with public toilets and minimal amenities, allocated on a basis of 24 square feet per adult, half of that for a child; to high-quality high-rises. The public rental program has been supplemented with a government-subsidized Home Ownership Scheme. A panoramic view of northern Hong Kong Island between North Point in the east and Kennedy Town in the west. The iconic Star Ferry on one of its nine-minute voyages across the harbor. Hong Kong is dominated by steep, hilly terrain, and some unusual methods of transport have been devised to ease movement up and down the slopes. For example, the Peak Tram has provided vertical rail transport between Central and Victoria Peak since 1888 by steeply ascending the side of a mountain. In Central and Western district there is an extensive system of escalators and moving sidewalks, including the longest outdoor covered escalator system in the world, the Mid-levels Escalator. Hong Kong has several different modes of public rail transport. The two metro systems for the city are the MTR (Mass Transit Railway) and KCR which acts as a link between Hong Kong and mainland China (KCR also operates a light rail system in northwest New Territories). These are operated by the MTR Corporation Limited and the Kowloon-Canton Railway Corporation respectively. The tramway system covers the northern parts of Hong Kong Island and is the only tram system in the world run exclusively with double deckers. Five separate companies (KMB, Citybus, NWFB, Long Win & NLB) operate franchised public bus services in Hong Kong. Double-decker buses were introduced to Hong Kong in 1949 and are now used almost exclusively, as in Singapore, Dublin and the United Kingdom. However, single-decker buses remain in use for routes with lower demand or roads with lower carrying capacity. Such single-decker buses are mainly used on Lantau Island and for overnight services. 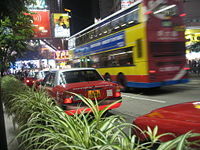 Most normal franchised bus routes in Hong Kong operate until 1 A.M.. Public light buses run the length and breadth of Hong Kong, through areas where standard bus lines cannot reach or do not reach as frequently, quickly, or directly. Taxis are also widely used throughout Hong Kong, with 99 percent of them run on liquefied petroleum gas; the rest are still diesel operated. 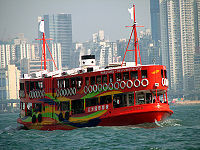 Most ferry services are provided by licensed ferry operators serving outlying islands, new towns, across Victoria Harbour, Macau and cities in mainland China. The oldest service, the legendary Star Ferry, operates four lines between Kowloon and Hong Kong Island and has provided cost-effective transport for over a century. It is popular with tourists desiring a panoramic view of Hong Kong's skyline and harbor, and many residents consider the Star Ferry as one of the city's most treasured cultural icons. Additionally, 78 "kai-to" ferries are licensed to serve remote coastal settlements. Hong Kong has one active international airport, known as Hong Kong International Airport located at Chek Lap Kok. When it opened in 1998, this replaced the former Hong Kong International Airport, Kai Tak Airport located at Kowloon City, which was simultaneously closed. After highly-publicized delays in the cargo systems during the first few months, the airport now serves as a transport hub for Southeast Asia, and as the hub for Cathay Pacific Airways, Dragonair, Air Hong Kong, Oasis Hong Kong Airlines, Hong Kong Airlines and Hong Kong Express. Both Hong Kong International Airport and Cathay Pacific Airways have been voted best in the world, in the airport and airline criteria respectively, by Skytrax from 2001 to 2005. Hong Kong International Airport served more than 36 million passengers in the year 2004, and increased to over 40 million passengers in 2005. Access to the airport includes 'Airport Express', 'CityFlyers' and 'Airbuses'. These services connect the airport to the rest of Hong Kong. The Airport Express zooms passengers to Central on Hong Kong Island in just 23 minutes. The recent opening of Sunny Bay Station of the MTR allows easy access to the Hong Kong Disneyland Resort. While the traffic in mainland China drives on the right, Hong Kong maintains its own road rules, with traffic continuing to drive on the left. The Hong Kong highway code uses the same road sign system as Great Britain, whereas the Chinese system is different. There are about 517,000 registered vehicles in Hong Kong, 64 percent of which are privately owned passenger cars. As a metropolis for luxury in Asia, Hong Kong is world famous for having the most Rolls-Royce cars per capita in the world. Because it has never been a sovereign state, Hong Kong has never had its own military forces except for voluntary auxiliary forces like The Royal Hong Kong Regiment (The Volunteers). All defense matters have been dependent on the state which controls Hong Kong. Before the British handover to PRC sovereignty, defense was provided by the British military, who stationed soldiers in barracks throughout Hong Kong, including the British Forces Overseas Hong Kong. These forces were supported financially by the Hong Kong Government. The People's Republic of China Central People's Government (CPG) assumed sovereignty over Hong Kong on July 1, 1997, and stationed a garrison of the People's Liberation Army (PLA) there to manage its defense affairs. Although the garrison has little practical military value, the stationing of the PLA troops in Hong Kong is a significant symbol of the PRC government's assumption of sovereignty over Hong Kong. According to Hong Kong's Basic Law, military forces stationed in Hong Kong shall not interfere with local civil affairs; the Hong Kong Government shall remain responsible for the maintenance of public order. The Hong Kong Garrison, composed of ground, naval, and air forces, is under the command of the Chinese Central Military Commission. The garrison subsequently opened its barracks on Stonecutters Island and Stanley to the public to promote understanding and trust between the troops and residents. Under British rule, Chinese Hong Kong residents (and other Hong Kong residents) were able to join the British Forces Overseas Hong Kong. ↑ The Basic Law of Hong Kong states that the official languages are "Chinese and English." It does not explicitly specify the standard for "Chinese." While Mandarin written in Simplified Chinese characters are the standards in mainland China, Cantonese and Traditional Chinese characters are the de facto standards in Hong Kong. ↑ Official Languages. Hong Kong Government (2006). Retrieved April 23, 2012. ↑ Hong Kong. The World Factbook. CIA (23 August 2010). Retrieved April 23, 2012. ↑ Geography and Climate, Hong Kong. Census and Statistics Department, Hong Kong Government. Retrieved April 23, 2012. ↑ Population and Vital Events. Census and Statistics Department, Hong Kong Government (2010). Retrieved April 23, 2012. ↑ Population Density by Area. Census and Statistics Department, Hong Kong Government (2009). Retrieved April 23, 2012. ↑ 7.0 7.1 7.2 7.3 Hong Kong. International Monetary Fund. Retrieved April 23, 2012. ↑ Human Development Report 2009 – Gini Index. United Nations Development Programme. Retrieved April 23, 2012. ↑ The name is often written as Hongkong in older English texts. The Hong Kong Government officially adopted the current form on September 3, 1926 (Hongkong Government Gazette, Notification 479, September 3, 1926). While the names of most cities in the People's Republic of China are romanised into English using pinyin, the official English name is Hong Kong rather than Xiānggǎng (See Pronunciation of Hong Kong). ↑ The New York Times. "NY Times." Thousands March in Anti-Japan Protest in Hong Kong by Keith Bradsher. Retrieved on 2006-04-11. ↑ Yong-hua Wang, On Embargo of Hong Kong in 1950-1954, Journal of Yanan University Social Science Edition, 2006. ↑ People's Daily. "People's Daily." Links between SARS human genes. Retrieved on 2007-03-06. ↑ "Chief Executive pledges a clean, green, world-class city," Hong Kong Trader, November 2001. Retrieved on 2006-05-27. ↑ "Hong Kong Hiking Tours," The Hong Kong Tourism Board. Retrieved on 2006-06-18. ↑ Keith Bradsher, March 22, 2007, NYtimes Dirty Air Becomes Divisive Issue in Hong Kong Vote. New York Times. Retrieved on 2006-11-05. ↑ Extreme Values and Dates of Occurrence of Extremes of Meteorological Elements between 1884–1939 and 1947–2006 for Hong Kong, Hong Kong Observatory. Retrieved on 2006-02-02. ↑ 22.0 22.1 Monthly Meteorological Normals for Hong Kong, Hong Kong Observatory. Retrieved on 2006-02-02. ↑ Donald Tsang set to be HK leader, BBC News, 2005-06-15. Retrieved 2006-05-14. ↑ Hong Kong Public Order Ordinance, World Corporal Punishment Research, February 2000. Retrieved 14 May 2006. ↑ Hong Kong democrats visit China, ABC News (Australia), September 25, 2005. Retrieved May 27, 2006. ↑ 2005–06 Budget Speech by the Financial Secretary of Hong Kong, 2005-03-16. ↑ "List of countries by GDP (PPP) per capita", Wikipedia. Retrieved on 2007-05-02. ↑ UCL.AC.UK. "UCL.AC." ICE Hong Kong. Retrieved on 2007-06-05. ↑ World-famous producer of luxury cars launches first Hong Kong showroom, InvestHK, 2003-7-30. Retrieved 2007-1-20. Edmonds, Richard Louis. China and Europe Since 1978: A European Perspective. Cambridge University Press, 2002. ISBN 0521524032. Fu, Poshek. and David Deser. The Cinema of Hong Kong: History, Arts, Identity. Cambridge University Press. 2002. ISBN 0521776023. Hong Kong History Society. Forts and Pirates - A History of Hong Kong. Hyperion Books. 1990. ISBN 9627489018. Lam, Derek. Mathematical Modelling of Hong Kong Political and Economical Development. Guangzhou Academic Press. 1986. Ngo, Tak-Wing. Hong Kong's History: State and Society Under Colonial Rule. (Asia's Transformations) Routledge. 1999. ISBN 0415208688. Porter, Jonathan. Macau, the Imaginary City: Culture and Society, 1557 to the Present. Westview Press. 1996. ISBN 0813337496. Shuyong, Liu. An Outline History of Hong Kong. ISBN 7119019465. Tsang, Steve. A Modern History of Hong Kong. London: I.B. Tauris. 2004. ISBN 1860641849. Wallace, Peter. Contemporary China: The Dynamics of Change at the Start of the New Millennium. Routledge, 2002. ISBN 0700716378. Welsh, Frank. A History of Hong Kong, Third Ed. HarperCollins. 1998. ISBN 1568360029. Wiltshire, Trea. (1987) Old Hong Kong Central. Hong Kong: Text Form Asia books Ltd., 2003. ISBN 9627283614. List of Declared Monuments in Hong Kong - 3 March 2006 from the Antiquities and Monuments Office. GovHK - one-stop portal of the Hong Kong SAR Government. CIA - The World Factbook — Hong Kong. Census and Statistics Department in Hong Kong. This page was last modified on 13 January 2018, at 23:44.